I wasn’t going to grow any tomatoes this year. The previous couple of years, have resulted in such a dismal crop of fruit, that it really wasn’t worth the effort, so I thought I’d take a year off from tomatoes and just grow cucumbers instead. That was until two separate people offered me a couple of plants. I changed my mind, not because I was particularly expecting any greater success, but because I thought I’d just give it a go, and I never like to turn down a gift of plants. Now the first lot had the label in the picture to the left, not very revealing. The second, the person who gave them to me was honest and said, he had no idea what they were, but he knew he’d sown a cherry and a beefsteak variety, so they would be one or the other. So I took them, grew them on, and eventually planted them into their final spot, when the first flowering trusses appeared. 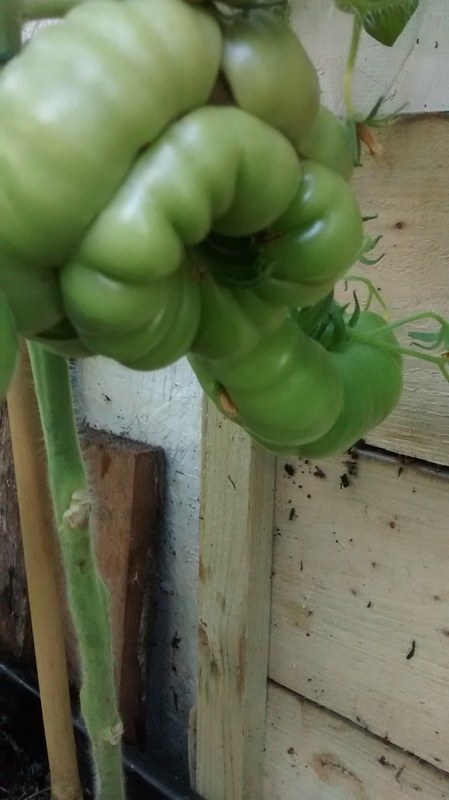 They’ve grown quite successfully, and I now have green fruits on both plants. It looks as though the cherry / beefsteak are in fact both beefsteak, or some kind of weird heirloom beefsteak, as they have grown some interesting fruit. The others are slightly more interesting. They rapidly grew fruit, and at first I thought they were going to be the good old gardner’s staple, Moneymaker. However, something weird started to happen. 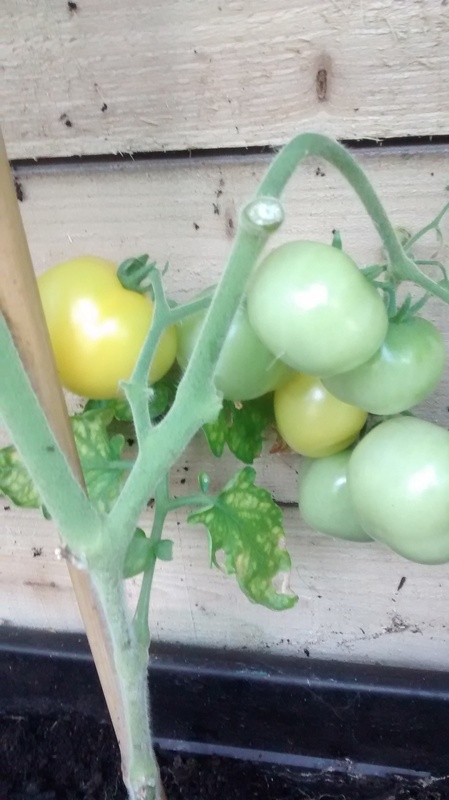 The fruits grew to a standard tomato size and started to ripen, turning from green, to yellow. They did not however reach the red that you would expect from a tomato. Instead they seemed to hold as this golden yellow for days. Eventually I realised that perhaps this was their final show, so I picked one. Now slightly over-ripe, they were a great tasting tomato, but they were never going to be red, only ever a golden yellow. I’ve still no clue as to what variety they really are, just that they taste great. Always a bit exciting to grow a new plant, even when it’s only the humble tomato! 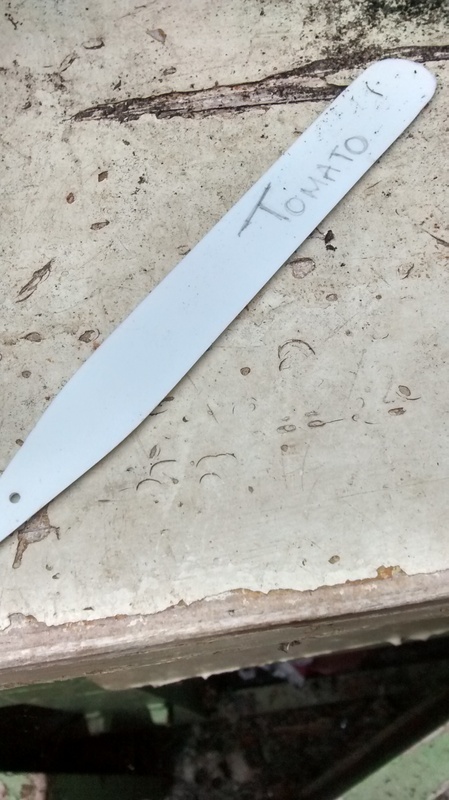 This entry was posted in Fork To Fork, Garden / Allotment and tagged Beefsteak tomato, tomato. Bookmark the permalink.